Applications for Fall 2019 CCSR Program now open. B:CIVIC’s mission is to promote and advance business philanthropy and community involvement across Colorado. 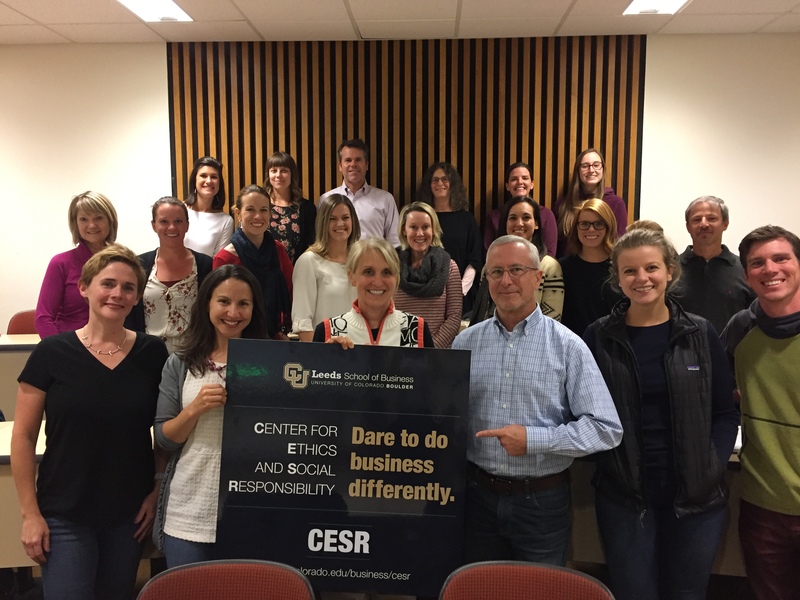 To further that goal, we are proud of our initiative to offer the CCSR program in partnership with the Center for Education on Social Responsibility (CESR) at the CU-Boulder Leeds School of Business. Above: Students of the fall 2018 CCSR Program. More and more businesses are joining the movement of conscious capitalism – choosing to evaluate their success on the “triple bottom line” – their impact on people and the planet, as well as making a profit. In addition, corporations face ever-increasing pressure from consumers, shareholders, and society to be more socially responsible. As a consequence, people leading CSR efforts within their companies are looking for ways to learn practical, applicable best practices that can help deliver maximum value back to their companies and the communities they serve. The CU-Boulder Leeds School of Business Certification in Corporate Social Responsibility, in partnership with B:CIVIC, is designed to address the evolving needs of CSR practitioners, regardless of role or title. And, whether you are an experienced CSR professional, just starting out in your CSR career, or wanting to make a career change in this direction, this certification program provides an opportunity to further your knowledge, ideas, and network within the Colorado CSR community. The CCSR course is collaborative, interpersonal and experiential, with dialogue-based learning involving the instructors, class cohorts, and guest speaker/subject matter experts. Apply – Please fill out the interest form to set up a telephone interview with the instructor. This interview will serve to answer your questions and determine whether or not the course is a good fit for your background and needs. After the interview, if you are accepted, we will share registration paperwork. There are 25 spots in the course are available. Certificate – Upon completion of the program, students receive a non-credit, professional Certificate in Corporate Social Responsibility from the Center for Ethics on Social Responsibility (CESR) of the University of Colorado, Leeds School of Business. Schedule – The course will comprise approximately 40 hours of in-person, interactive class time, and will require up to three hours of outside reading and preparation each week. Classes will be held on Wednesdays, 5:30-8:30 PM, from September to December. There will be two weeks off, dates TBD. In-person attendance at 10 out of 14 sessions is required. All sessions are broadcasted via video conference and recorded. Students – A cohort of up to 25 professionals will be accepted. Participants include, but are not limited to VPs/directors/managers of CSR, community relations, sustainability and communications; small business owners/partners/senior management; and consultants/agencies. Individuals from for-profit, corporate and community foundations, academic institutions, business associations, and public sector organizations are welcome and encouraged to apply to this course. Instructors – The course is led by Pete Dignan, a 3-time CEO of Certified B Corps, and features guest speakers with deep expertise and practical experience in CSR. The curriculum was developed by Geri Mitchell-Brown. Format – The course will be collaborative and experiential, with dialogue-based learning involving the instructors, cohort members, and CSR experts. Tuition – Tuition is $2,250. Tuition is due to the Division of Continuing Education no later than the day before the class starts. Questions? Please contact Jess Welser at 303.620.8085 for more information. Congratulations to all of the graduates from the first-ever CSR Certification program at the Leeds School of Business, CESR Center, presented in partnership with B:CIVIC. The graduates gathered Dec 14, 2016, to celebrate the completion of their program. 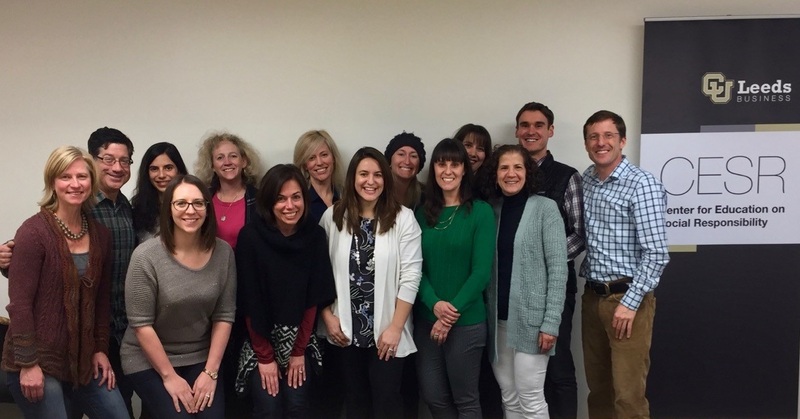 Shown from left to right, front row: Geri Mitchell-Brown (instructor), Tricia Vincent, Lora Ledermann, Jessica Sibila, Heidi Box, Robin Fleishmann, David Payne (instructor). 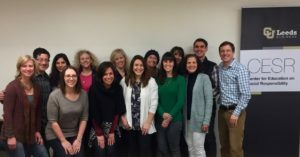 Back row: Marc Ross, Sarae Kurth, Lisa Konen, Karla Baise, Karen Spencer, Amy Rosenblum, Brian Lichtenheld. Not pictured is Denise Jendrusch. Creating the Certification Program – Background and Thanks! This program grew out of the initiative of B:CIVIC who, together with the CU Leeds Center for Education on Social Responsibility (CESR) and several passionate volunteer CSR professionals, collaborated during 2015 and 2016 to envision and map out the program. These efforts included defining the program focus to address core competencies in CSR, incorporating peer-learning, providing best practice examples from guest speakers, including B:CIVIC member companies, enhancing the CSR profession, and enabling those from B:CIVIC member companies first opportunity to enroll each session. The program was the first of its kind in the metro Denver region when it kicked off in the fall of 2016.